The combinations and sequence for lethal injection drugs posted in a room next to the death chamber at the Southern Ohio Correctional Facility in Lucasville, Ohio, in 2005. An execution in Oklahoma was halted Tuesday night after the first of three lethal injection drugs was administered and the recipient, Clayton Lockett, showed signs of being conscious and in pain. The administering doctor discovered that the intravenous line delivering the drugs “had blown,” according to The New York Times. Lockett, 38, later died of a heart attack. Oklahoma had planned two executions Tuesday night, but the state suspended the second one. 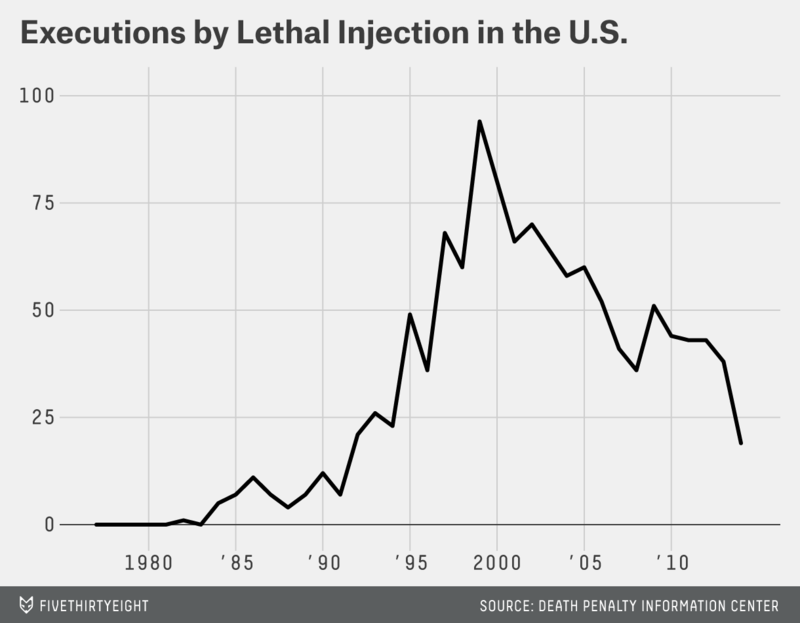 Botched executions have been a problem for the American legal system. A 2012 study published by the British Journal of American Legal Studies examined 9,000 executions that had taken place in the United States from 1900 to 2010 and found that 270 executions had involved “departures from the protocol of killing someone sentenced to death” and were therefore botched. Overall, the researchers concluded that 3 percent of executions in the United States are botched and that lethal injection, the method of execution in the Lockett case, has had a higher botching rate than any other method. The Death Penalty Information Center (DPIC), a nonprofit organization whose stated goal is to inform the public on capital punishment, has built a database of 1,378 executions in the United States from 1977 to April 23, 2014. (We checked its figures against those from the Bureau of Justice and found the same total.) As of last week, 19 executions had taken place so far this year, all of them by lethal injection. The primary method of execution in the United States is now lethal injection, accounting for 87 percent of all executions in the past 37 years. The DPIC has also attempted to keep track of botched executions — although its list is not comprehensive and hasn’t yet been updated to reflect the most recent news. All of the cases the organization lists as “botched” are so in the sense that the prisoner’s death did not come about with the intended speed. The DPIC highlights 44 mismanaged executions — of which 32 were intended to be death by lethal injection. Those 44 cases represent 2 percent of the executions in the DPIC data set, a rate fairly consistent with the British Journal of American Legal Studies paper.